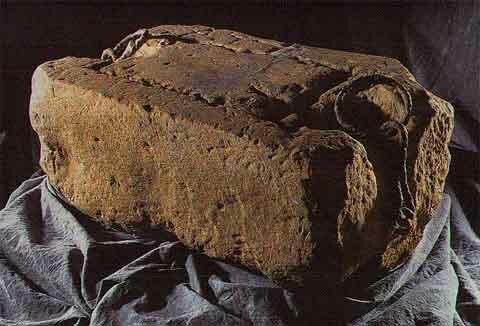 The Stone of Scone, more commonly known as the Stone of Destiny or the Coronation Stone (though the former name sometimes refers to Lia Fáil) is a block of sandstone historically kept at the now-ruined abbey in Scone, near Perth. It is also known as Jacob's Pillow Stone, Jacob's Pillar Stone and as the Tanist Stone. In 1996 the British Government decided that the Stone should be kept in Scotland when not in use at coronations, and on November 15, 1996, after a handover ceremony at the Border between representatives of the Home Office and of the Scottish Office, it was returned to Scotland and transported to Edinburgh Castle where it remains. Although the Stone is back in Scotland, Edinburgh Castle is the military headquarters of the UK army in Scotland, and some Scots have argued that the stone should be kept someplace solely Scottish, someplace which could not be interpreted as symbolic of United Kingdom union. Provision has been made to transport the stone to Westminster Abbey when it is required there for future coronation ceremonies. Jacob then named the place Bethel (literally, "House of God". "El" is one short form of "Elohim"). The name "House of God" and the term "gate of heaven" are suggestive of the metaphor of the temple as the earthly abode of a deity; this is reinforced by the image in Jacob's dream of a ladder between heaven and earth which the angels of God and (according to the "beside him" reading of the text) God himself use to come down to earth. Where is the Gate of the Heavens? - Tower of BabyLon(don)? ...Jacob's experiences in Charan, where he fled to escape the wrath of his brother Esau, who is angry with him because he stole the blessing (Bereishit 27). Jacob leaves Beersheba, on his way into exile, stops for a nights rest in a place that was to become known as "Beit El" (the house of God) and there he dreams a dream. In his dream: "Behold a ladder set up on the earth, and the head of it reached heaven and behold the angels of God ascending and descending on it" (Bereishit 28:12). 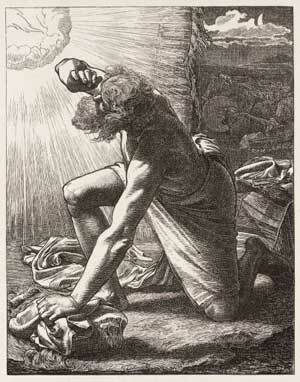 After this God reveals himself and promises to protect Jacob wherever he may travel, to give him the "land upon which you lie" (verse 13) and even a multitude of descendants: "Your seed shall be as the dust of the earth and you shall spread to the west, to the east to the north and to the south" (Verse 14). The continuation of the narrative tells: "And Jacob awoke out of his sleep and he said: Surely the Lord is in this place: and I knew it not. And he was afraid and he said: How terrible is this place! This is none other then the house of the Lord and this is the gate of heaven" (verses 16-17). The description of the height of the ladder that Jacob sees "the head of it reached heaven", reminds us of the description of the tower of Babel, by its builders: "We will build a city and a tower with its head reaching heaven" (Bereishit 12:4). The story of the building of the tower of Babel is a story of human pride that knows no limits. Man wants to build a tower and make a name for himself (ibid verse 4), to cross the boundary between heaven and earth, between man and God. Man's punishment is not slow to come: God scatters them on the face of the earth and divides them according to their languages so that no one understood his fellow man. The story concludes with a Midrash mocking and poking fun at the name Babel: "therefore they called its name Babel because God balal (confused) the languages of the earth" (verse 9). Hereinafter we shall see how the residents of Babylon explained the name of the city they dwelt in; the Torah in any case explains it in terms of confusion and intermingling. In the whole Bible we find no other similar phrases to the abovementioned two: "and the head of it [the ladder] reached heaven" and "a tower with its head reaching heaven". The similarity between the two phrases should attract the attention of the reader and cause them to compare the two stories in which they are found. But one thing must be remembered: the reader should not be satisfied with finding similarity but even more importantly should look for dissimilarity and even disagreement between them, as it could in fact be there that the message lies. The following is a comparison between the story of the tower of Babel and Jacob's ladder. 1. While the tower connects between earth and heaven, it is the initiative of man; the revelation of the ladder in Jacob's dream is an expression of God's will. Man remains on earth but, if God wills it, man can witness a revelation that connects between heaven and earth. 2. Man's plot to ascend to the heavens does not succeed and God stops the building process. In contrast, the ladder does connect between heaven and earth and ministering angels ascend and descend upon it, as only they are able and allowed to do so. 3. In order to view man's handiwork, the building of the tower, God descends from his place: "And God descended to see the city and the tower which man had built" (12:5). When talking to Jacob, God stands at the top of the ladder: "And behold the Lord stood above it and said 'I am Hashem, the God of Abraham" (28:13). 5. In the labor of construction by the builders of the tower there is an expression of defiance against heaven. Jacob's placing of the stone - and the building of a house of God in this place in the future - is to honor God. 6. The builders of the tower begin their initiative when they "travel from the east" (12:2). Jacob goes "to the land of the people of the east" (29:1) after he vows to establish a house of God when he returns to his father's house. 7. The fear of the tower builders, "lest we be dispersed on the face of the earth" (12:4), comes to pass when God punishes them: "And God dispersed them on the face of the earth… and from there God dispersed them on the face of the earth" (12:8-9). God promises Jacob that he will bring him back to his land from the place of his exile: "And I will bring you back to this land because I will not abandon you" (29:15). 8. As in the story of the tower of Babel, in the story of the ladder, the name of the place is also elucidated. In this case the name "Beit-El" (house of God) is explained in a positive light, which expresses God's presence in that place: "…How terrible is this place! This is none other then the house of the Lord …" (verse 17), "And called the name of that place Beit El" (verse 19), "and this stone which I have placed as a monument will be the house of God" (verse 22). 9. And most importantly for our discussion: Jacob continues and declares that the place where an aperture was opened for him to see God and his angels ascending and descending on the ladder is the "gate of heaven" (verse 18). This is a clear expression of polemic against the Babylonian outlook, who saw their city in this way, since the name "Babel" was explained by the Babylonians as the "gate of God" (bab-ili) or "the gates of the gods" (bab- il?ni), in other words "the gate of heaven". 10. Our story declares that the gate of heaven is found in the land of Israel and not in the land of Shen'ar, in Beit-El and not in Babylon; a place where the believer expressed thanksgiving to his God who was revealed to him and not a place where man wished to conquer God's dwelling place. Babylon is no longer worthy of the name "gate of heaven" and it now refers to Beit-El. Transfer of the place of "the gate of heaven" from Babylon to Beit-El is not the conclusion of the process. In the story of the threshing floor of Arvana, the story of the dedication of Jerusalem in the days of David, as it is told in the book of Divrei Hayamim (Chronicles), we find a verse that has no parallel in chapter 24 of Shmuel II, which is the original source for the compiler of Divrei Hayamim: "And David said: This is the house of God and this is the sacrificial altar for Israel" (Divrei Hayamim I 22:1). The phraseology is very similar to that of Jacob in the story of the ladder ("This is none other than the house of the Lord and this is the gate of heaven" [verse 17]), and it seems that this is an attempt to identify various places of ceremonial significance, Beit-El and Jerusalem, as one place. This notion is mentioned later in the Midrash. There it is told that Jacob went to "Mount Moriah … and he lay down to sleep there because the sun had set … and he awoke suddenly with great fear and said: This is the house of the Holy One, blessed be He, in this place it was said 'this is the gate of heaven'". After Jacob erects a monument, "what does the Holy One, blessed be He, do? He put his right foot down firmly and pushed the stone down to the depths of the earth … and on it the temple of God stands as it is written "and this stone which I have placed as a monument will be the house of God" (Pirkey D'Rabi Eliezer, chapter 35). Is the Stone of Scone or Jacob's Pillow/Pillar stone a cornerstone or a keystone of Solomon's Temple or from the Tower of Babel/Babylon? Are we talking about the same stone, the Coronation Stone, that used to be in Westminster Abbey, London? From where the British-Israel World Federation Rules. Are they part of the lost tribes of Israel, now under a banner of the United Kingdom of Heaven? The basis of these patterns is a temple groundplan. It is the most important construction of sacred geometry and one that has been used in the design of temples throughout the centuries. Indeed, the oldest example of its use is in the construction of Stonehenge. To find exactly the same design, but at a much larger scale, hidden within the London landscape is startling to say the least. To find that it is defined by some of London's most important ancient sites, Westminster Abbey, St. Paul's Cathedral, The Tower of London and others too numerous to name here, is astonishing evidence that this discovery has a firm foundation in reality. Is London the New Jerusalem, the City of Revelation? The Earthstars geometry is of immense significance, incorporating a harmonic relationship with the structure and dimensions of the Earth and Moon. This has been noted previously by no less an authority on these subjects than John Michell who also associates this geometric construction with the measures and proportions attributed to The City of Revelation, the New Jerusalem, described by St. John in The book of Revelation. Remarkably, this is an unusual confirmation of William Blake's visions of Jerusalem within London's spiritual dimensions. Since the City of Revelation is said to appear at the end of the age, perhaps it is no concidence that this discovery has come to light at the turning point of the millenium. Rather worryingly, it is more likely to be environmentalists who warn us that the end is nigh these days, rather that visionaries like St, John or William Blake. There is a legend that the Knights Templar smuggled out a treasure they excavated from under the Dome of the Rock in Jerusalem (where Solomon Temple once was). This treasure eventually ended up at Rennes le Chateau in Southern France, with some kind of connection to the Cathars (another lost tribe?). We had read about the statement “This place is terrible” above the church door, which is a quote from The Book of Genesis, specifically the story in which the patriarch Jacob falls asleep on a stone and has a vision of a ladder leading up to Heaven, with angels ascending and descending upon it. This stone is the same as the Stone of Destiny brought to Scotland by the prophet Jeremiah, and it became the stone upon which British monarchs are coronated to this very today. What is noteworthy is that beneath the words “This place is terrible” on the doorway, we have the rest of the quote from Genesis: “This is the house of God and the gateway to Heaven.” It is thus not a curse but a statement upon the dual nature of divinity. 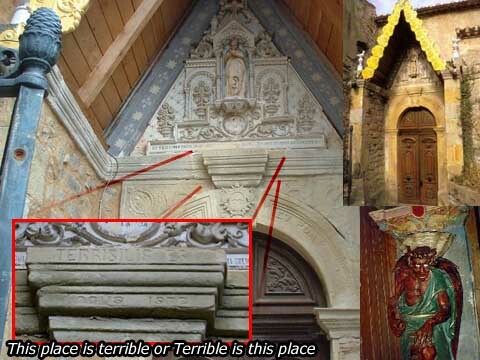 This is actually how the quote from We also found quite a bit of iconography etched over the doorway that has not been previously noted, including two Templar crosses, two Crosses of Lorraine, and the Masonic image of the “Blazing Star” which purportedly fell from the heavens to enlighten mankind. And Jacob awoke out of his sleep, and he said, Surely Jehovah is in this place; and I knew it not. And he feared, and said, How terrible is this place! this is none other than the house of God, and this is the gate of heaven. Keep in mind also that the Scottish rite of Freemasonry probably are directly spawned out of the Knights Templar who fled to Rosslyn, Scotland and built the Rosslyn Chapel. They fled due to the catholic church. The Above article from wikipedia on Stone of Scone states: "It was originally supposed to have been used as the Coronation Stone of the early Dalriada Scots when they lived in Ireland. When they invaded Caledonia, it is said to have been taken with them for that use. Another theory states that the stone was actually the travelling altar used by St Columba (Illuminati Warning) in his missionary activities throughout what is now Scotland." Could there be a Phoenician/Canaanite connection to the Dalriada Scots or the Picts and therefore to Solomon’s Temple? Scholars have written for centuries about an ancient sea-faring people known to modem history books as the Tuatha de Danan who founded civilizations in Greece, Spain, Britain, and Ireland. Scholars now know that the word, Tuarth, means 'tribe'. Dr Gordon has also established that the suffix, 'AN' was added to proper names in early times to signify a people or community. Thus, the name of these important early European colonists should be translated, the 'tribe of Dan.' Was this the Biblical people, one of the twelve tribes of Israel? Would you believe these are you (Isaiah says; to the "isles afar off")? Are they descendents of the British Isles, Ireland, the countries of northwest Europe, the United States and even Japan? One important link/key is the term Scythians (Celts); "the people who dwell in booths". 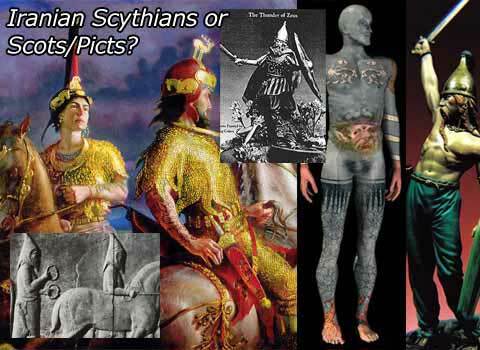 Scythians (Iranians) & Celts (Scots & Picts) Are they the same? Did the prophet Jeremiah (a Chief of Iber) die in Ireland? Did he travel there in 583-560 BC from Egypt around the same time of the destruction of Jerusalem, with: the scribe Baruch, Ebed-Melech, Tea Tephi (daughter of Zedekiah & heir to the throne-line of Pharez), and the son of the king of Ireland who had been in Jerusalem at the time of the siege? Did Jeremiah come to Ireland to build the nation Israel in the Isles of the West and to plant the royal line of David upon Israels throne in the person of Zedekiahs daughter, Tea Tephi? Tea Tephi is the name of the most celebrated queen in early Irish history. With her the lion came into Irish heraldry, an emblem of the Israelites, but especially of the tribe of Judah. With Tea Tephi also a most remarkable 400 pound stone came to Ireland called the Lia Fail, or stone wonderful, or Stone of Scone upon which the Irish line of kings were crowned until about 500 A.D. 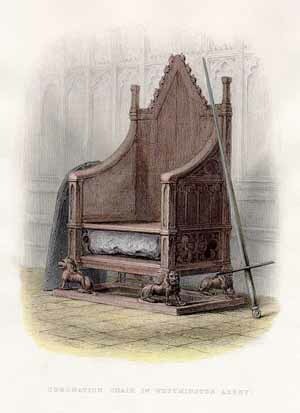 Thereafter it was carried to Scotland and used as coronation stone there till 1296 A.D. Then Edward I carried it to Westminster Abbey where it has been ever since, until just recently when it was returned to Scotland, as the Coronation Stone of Great Britain. Was Jeremiah the elderly white-haired patriarch, sometimes referred to as a "saint," who came ashore in Ulster in Irish tradition? Wasn't Jeremiah the grandfather of King Zedekiah (last king of Judah); and thus, God's Trustee of the Bloodline and the Throne of David? From these sources we learn that about 565 B.C., soon after Jeremiah and the kings daughters disappeared in eastern history, there appeared in Ireland at Tara, the seat of the Irish kings, a remarkable and mysterious personage, a prophet named Ollam Fola, who instituted a school of prophets in Ireland. From the number of Hebrew words connected with this mysterious personage he is shown to have been a Hebrew prophet. The only Hebrew prophet who disappeared with any such mission as would take him to the Isles of the West, was Jeremiah, whose bust is in Dublin Castle. The name of Jeremiah remains everywhere in those parts even today. Could a female further the bloodline? Did Jeremiah bring the ancient Jewish coronation stone to Ireland (was the throne then overturned 3 times, and now is in London?)? Was it moved three times (finally to England) in fulfillment of Ezekiel's prophecy mentioned in chapter 21, verses 25-27? Did St. Andrew journey to Scotland? Is Israel today Ephraim? Is Britain and the United States Manasseh? Legend says Ireland was already populated by Hebrews before Jeremiah's arrival. Long prior to 700 B.C. another strong colony called "Tuatha de Danaan" (tribe of Dan) arrived in ships, drove out other tribes, and settled there. Later, in the days of David, a colony of the line of Zarah arrived in Ireland from the Near East. In light of this, imagine how fruitful the Irish potato famine has proven to be.... Or, is all the above a fabrication started via a book ("England the Remnant of Judah." London, 1861) by British-Israel expositor named Rev. F.R.A. Glover who combined two different people Tea and Tephi from two different time periods? Is the Worldwide Church of God behind furthering this confusion? Or, is it all true?? Teia Tephi was the daughter (Tender Twig) of the king of Jerusalem (the Cedar) whom Jeremiah went forth to PLANT in Ireland after the ROOTING-OUT and DESTRUCTION of Zedekiah, the king of Jerusalem in c. 588 B.C. The Book of Tephi describes in detail the journey Jeremiah took with Teia Tephi, The Lia Fail (Stone of Destiny) and The Ark of The Covenant from Jerusalem to Ireland, via Tanis in Egypt (as in "Raiders of The Lost Ark") then on to Gibraltar (where she was proclaimed queen of the Gadite Israelites who live there); Breogan in Spain; Cornwall and eventually landing at Howth, near Dublin, in Ireland on the 18th. of June 583 B.C. The Book then goes on to describe many of the significant events which occurred at that time in history and are associated with her journey from Jerusalem to Ireland. It is also full of Prophecies about many of the major events which have occurred in the world between her and our time (2,500 years); including the First-Coming of Christ and the colonizing of the world by the British Empire. The Book also gives some very significant prophecies about the times we now live in. Perhaps the most relevant of her Prophecies, which is the only one in "The Book of Tephi, queen of Tara and Gibraltar" that remains to be fulfilled, is about this (our) time in history when she predicts that she would be recovered from her subterranean tomb on The Hill of Tara, in Co. Meath, Ireland; along with The Ark of The Covenant and once again bring peace and unity to all of Ireland as she had done two and a half thousand years ago; and that Christ would come out of her tomb with her, to be inaugurated King of all of Ireland, on the Stone of Destiny, at Tara, and this time, also bring peace and unity to the whole world. Why is there a Jewish Star/Star of David (Magen David) or Shield of David, Solomon's Seal on the Ulster Flags symbols and emblems of Northern Ireland? The Orange Order is another name for the same Ulster separatist movement. It's a freemasonic protestant movement of Northern Ireland with William of Orange as the "hero". See: the Grand Orange Lodge of Ireland for more. Do you remember the Israeli "Orange" revolt? Very similar to Ukraine's "Orange Revolution" with Viktor Yushchenko as front man. There is a message here folks! Considering the whole British-Israel Word Federation thingy going on, I find all these connections very interesting. Is there a connection between these geographical locations? Are they trying to unite the lost tribes and set up a United Kingdom of God? What's the plan here?